When storing flammables, or combustibles it is extremely important to comply by federal and state regulations. Flammable materials or combustible materials should be stored in limited quantities to the amount necessary for the operations used. Flammable liquids should be stored in hazmat containers and be stored separately from oxidizers. Hazmat containers that are housing flammable or combustible materials should be shielded form sunlight and heat sources. Flammable & combustible materials may give off vapors or fumes that can be harmful to human health and can potentially be deadly. 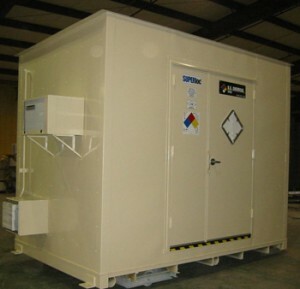 Hazmat containers that are used for storing flammable or combustible materials might have electrical equipment, including switches, outlets, motors, and relays that can cause sparks that can ignite vapors or fumes. Electrical equipment that is used during storing flammable and combustible chemicals should be explosion proof and managed properly and fully compliant. The development of static electricity is related to the humidity levels that are present. A dry and cold chemical storage atmosphere is more likely to facilitate static electricity, therefore a mechanical ventilation is very important. Mechanical ventilation systems offer a safe and reliable chemical storage atmosphere for the safety of your personnel and investments. Mechanical, or forced, ventilation is an important part of storing chemicals that give off harmful vapors, fumes or toxic dust. In order to keep your hazmat conatiners safe from a toxic environment, the air inside must be replaced often enough to keep fume build up at a safe level. Mechnical ventilation is the ideal solution when air changes are necessary. U.S. Chemical Storage offers mechanical ventilation units that perform at a rate not less than 1 ft3/min/ft2 with a minimum of 6 air changes per hour for your complete safety, while remaining 100% compliant.